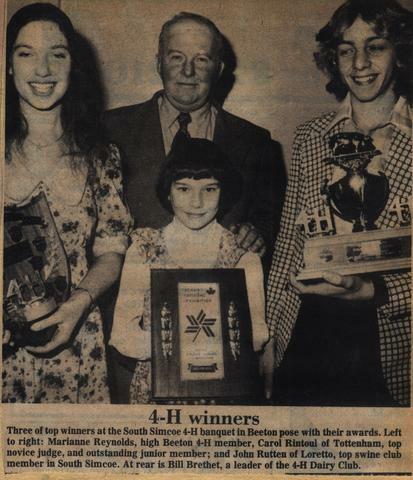 "Three of top winners at the South Simcoe 4-H banquet in Beeton pose with their awards. Left to right: Marianne Reynolds, high Beeton 4-H member, Carol Rintoul of Tottenham, top novice judge, and outstanding junior member; and John Rutten of Loretto, top swine club member in South Simcoe. At rear is Bill Brethet, a leader of the 4-H Dairy Club."